The acclaimed New York Times bestseller, now in paperback! "Always fascinating and very funny, Alyssa's book is full of juicy stories from one of the world's most glamorous jobs." - Mindy Kaling, New York Times bestselling author of Is Everyone Hanging Out Without Me? (And Other Concerns) and Why Not Me? Told in a smart, original voice and topped off with a couple of really good cat stories, WHO THOUGHT THIS WAS A GOOD IDEA? is a promising debut from a savvy political star. 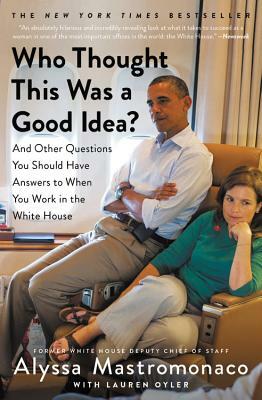 Alyssa Mastromonaco served as assistant to the president and director of scheduling and advance at the White House from 2009 to 2011 and as assistant to the president and deputy chief of staff for operations at the White House from 2011 to 2014. She currently works as chief communication and talent officer at A+E Networks and is a contributing editor at Marie Claire. "Always fascinating and very funny, Alyssa's book is full of juicy stories from one of the world's most glamorous jobs. "—Mindy Kaling, New York Times bestselling author of Is Everyone Hanging Out Without Me? (And Other Concerns) and Why Not Me?